We have the pleasure of vacationing in many places throughout New Mexico, Colorado, California and Arizona on a yearly basis and I have many posts to share, but today I wanted to share my camping experience at Willow Creek Campground in Heron Lake State Park. frequented Hilton Garden Inns and Holiday Inn Expresses for years while on vacation before we decided to invest in our first bumper pull travel trailer (Heartland North Trail). We have since upgraded to a Fifth wheel (Heartland Sundance) because we enjoyed this experience so much. Our 4 year old daughter KellieLynn and 9 year old English Labrador Jasmine have grown accustomed to this type of camping also. Heron Lake State Park and El Vado Lake State Park are both within close proximity to each other and are located at the northwestern side of New Mexico. They are approximately 3.5 hours north of Albuquerque, New Mexico. Heron Lake State Park is also conveniently located 25 minutes from Chama, New Mexico a quaint town with New Mexico charm and also where you find the Cumbres and Toltec Scenic Railroad. Heron Lake, Elvado Lake State Park (both are no wake meaning trolling speed only), and Abique Lakeare also known for Salmon Snagging season and from my conversations with both campground hostsand Park Rangers, this event may not be recommended for family outings as it seems to very popular amogst competitive adults with trebel hooks. This New Mexico State Park accepts online reservations starting April 2nd until September 17th or via telephone at 1-877-664-7787. To contact Heron Lake State Park directly call 575-588-7470. El Vado State Park can be reached at 575-588-7247. The campground is open year around. However, if you visit after September 17th (as we enjoy doing) and before April 2nd please prepare for what is considered walk up only campsites. Also prepare to self pay with a check made payable to New Mexico State Parks or bring cash. You will have to drive to the campground of your choice and locate an unoccupied site which can be nerve wrecking because you don’t know what sites will be available at the time you pull in. To save you time and since the self pay station is a short drive from the campgrounds, I picked up a couple self pay permits on our way in. Fees are due immediately upon occupying the site. If you write your check in advance, or place cash in the self pay envelope and then decide you want to leave a day early, you WILL NOT get a REFUND. You can pay for your site daily so long as you pay before 11AM. This comes in handy if you want to move to a different site while its considered walk up only-no reservations. On this trip we had the pleasure of staying in a full RV hookup camping spot that included water, electric, and sewer for $18 a night. We noticed a few tent sites available in this loop and those run anywhere from $10 to $12 a night. There are also spots with RV hookups for water and electric for $14 a night. If you decide to bring your boat and cannot pull it behind your Rig, you must pay an extra vehicle fee which costs $10 a night. With this in mind, please know that there is a limit on the combined towing length for your state. So, on this trip I drove our 4Runner pulling our boat because if we towed it behing our Fifth wheel we would have been over the New Mexico towing length maximum. The Willow Creek campground provided clean restrooms. The Blanco Campground had a shower facility, and both had access to the RV dump station. We came to Heron Lake State Park this year to fish, and we did everyday for 6 days (mornings and evenings). On a couple of days at Heron Lake Dam we got the whole area to ourselves. We used power bait, worms, corn and the recommended lures and still didn’t catch anything. Thank goodness I never add fish on the camping menu as a meal for this reason, but it sure is a nice bonus and a tasty one when we do catch em. 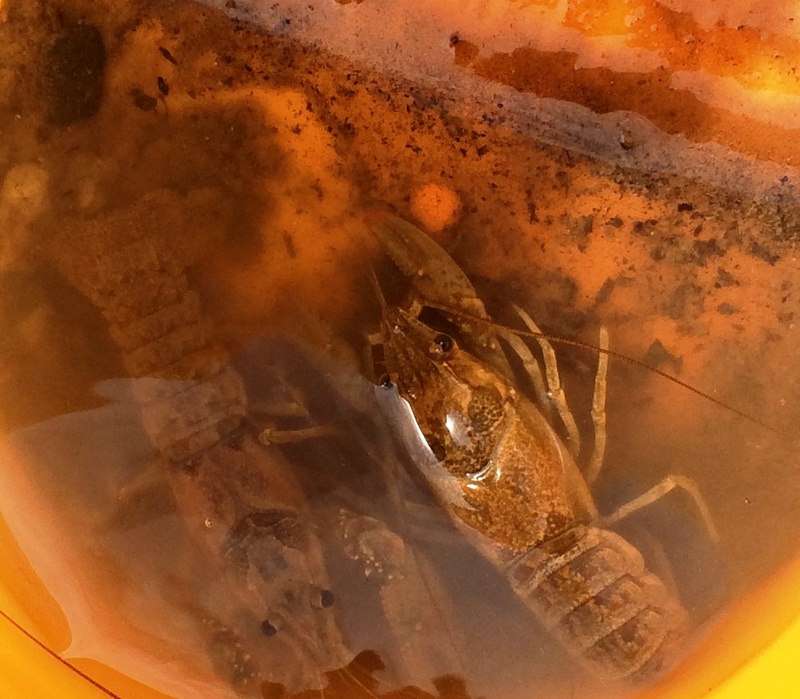 We did manage to pick up a couple little curious crawdads. We released them back into the water shortly after showing them to my 2 year old niece who found them amusing, and our KellieLynn who swore they were cute baby Lobsters. By the way, If you have Verizon wireless as your cell phone service please beware that you will get cell service, text messaging and the ability to take photos and send them all even while you have your fishing line in the water at the lake. I use my phone on vacations primarily for capturing family moments on camera and because it saves me from having to carry another piece of equipment, so I just expect to take important calls. For us REALTORS, this is a bonus because we can still do business while on the lake. We also experienced uninterrupted service during our stay in spot 3 and my dad’s spot 4 in the Willow Creek Campground and this week we experienced gusty winds, rain and thunder storms, and days with sunshine. Aside from fishing, exploring Tierra Amarilla and Chama Valley, there were a couple of nature trails that took you around the campground and one that took you to the Visitors Center/Park Office. We also enjoyed seeing many Deer, Elk and Turkey around the campgrounds and off to the side of the road near the Dam. On this trip we were stopped by a couple of tourists who were visiting from out of state and staying at a private RV park. They were told they could feed the deer by using corn nuts, and the deer were friendly enough to eat right out of your hand. We advised them to drive down the street to the Visitors Center/Park Office located on HWY 95, just a few miles north from Willow Creek Campground. Now we didn’t get an opportunity to feed deer but we enjoyed seeing them around the campground. I also want to mention Lowes Grocery/Ace Hardware store in Chama Valley. Lowes was located a short 25 minutes from our campground. We shopped here twice while we were on vacation. They had an abundantly stocked store that included fresh produce, meats perfect for barbecues, canned goods, frozen foods, pet supplies, ice they make in store, adult beverages, camping supplies and equipment, RV supplies and equipment which included fuses we needed that day. They also sold clothing, fishing supplies, traps, hardware items including tools, cables (we also forgot a usb connection and they had it), toys, and much more. This was a clean store with friendly, helpful and knowledgeable staff. Thank you for stopping by! Sending great thoughts your way!